After Gov. Greg Abbott announced a Jan. 11 gathering of the State Preservation Board, which oversees the Capitol grounds, the likely next Texas House speaker applauded a "meeting to begin the process of removing” the controversial plaque. The "Children of the Confederacy Creed" plaque has drawn controversy for its denial that preserving slavery was an underlying cause of the Civil War. Miguel Gutierrez Jr. / The Texas Tribune. After a yearlong push to remove a controversial "Children of the Confederacy Creed" plaque from inside the Texas Capitol, momentum appears to be picking up steam. On Monday Gov. Greg Abbott announced a Jan. 11 meeting of the State Preservation Board that oversees the Capitol grounds and the likely next Texas House speaker said he supports removing the plaque, The Dallas Morning News first reported. The plaque, which was erected in 1959, asserts that the Civil War was “not a rebellion, nor was its underlying cause to sustain slavery." 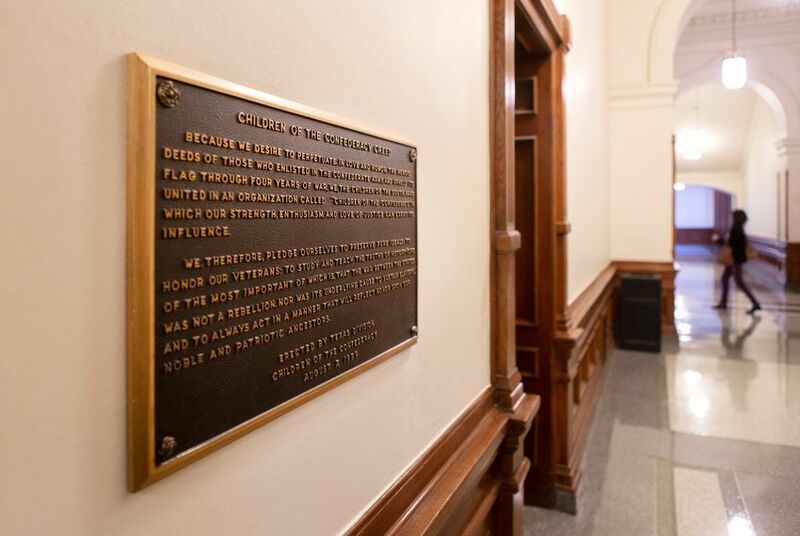 Republican state Rep. Dennis Bonnen, who is expected to lead the lower chamber next year, applauded Abbott's efforts and voiced his support for removing the plaque. "I commend the Governor for calling this meeting to begin the process of removing the confederate plaque from the halls of the State Capitol," the Angleton lawmaker said in a statement to The Texas Tribune. "It is historically inaccurate, and I stand by those who have called for its removal." Abbott called the meeting in a letter, which did not specify an agenda, to Preservation Board Executive Director Rod Welsh. But a spokesperson for the board told the Tribune this will be the Abbott-led board’s first meeting since March 2017, and word of it comes nearly two weeks after Attorney General Ken Paxton issued an opinion saying the Legislature or the panel have the power to unilaterally remove the plaque. The meeting will fall three days after the start of next year's legislative session, when Bonnen is expected to take over the speakership. Both the Texas House speaker and the lieutenant governor serve as co-vice chairs on the preservation board under Abbott. Johnson told the Tribune late Monday he was glad to have Bonnen's support. "He rarely minces words and he rarely hesitates to act, and so I’m glad he agrees that the plaque should come down, which I am confident it will," Johnson said. Texas employees get Friday off to celebrate "Confederate heroes"